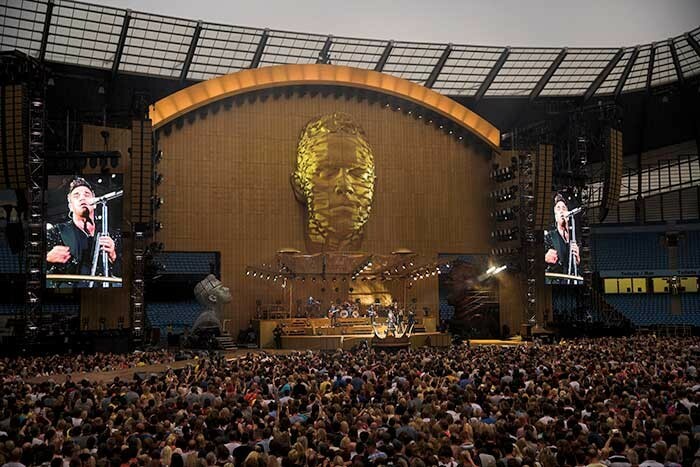 A bespoke automation system has been designed by Kinesys to open and close two large set doors integrated into the rear video wall backdrop on Robbie Williams’ current ‘Take The Crown’ stadium tour. 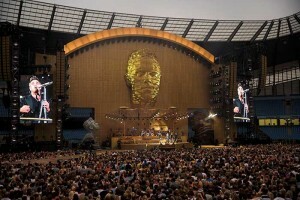 The doors – positioned stage left and stage right - each measure 7.73 metres high by 6 metres wide and open and close to allow set trucks with giant heads of the singer to enter and exit the stage. Kinesys was contacted by the tour’s set technical manager Nick Evans and head rigger Jerry Hough and asked to come up with a neat and safe automation solution for quickly opening and closing the doors - that had been mechanically engineered by TAIT. The particular challenge with operating these doors is they are required to tilt back 6 degrees before raising 7 metres to fully open. The mechanics of the system were designed and engineered by TAIT’s Pieter Denijs and Jerry Hough and features a counterweight system driven by Kinesys Elevation vari-speed hoists to lift the doors and linear actuators to operate the tilt mechanism driven by Kinesys Evo drives. This theatrical style approach utilising counterweights means less force is needed to move the doors, which each weigh over 2 tonnes … and can open or close in around 25 seconds. The back wall itself is constructed from LED-integrated polycarbonate panels incorporating 18,000 of TAIT’s Pixel Tablets. Hough specifically wanted a really simple handset to control the door movement with just ‘open’ and ‘close’ buttons "similar to a warehouse door". The custom control system devised by Kinesys combines the actuator movement to tilt the door back with the Elevation hoist lifting operation into a single open and close sequence. Safety features such as ‘dead man’s handles’, interlocking between the tilt and lift operations, and ‘group halt’ on error or position difference make the system safe for operation during fit-up and show conditions. On the road, the door movement is being looked after and operated by riggers Jules Grommers and Craig Rattray. Grommers comments: "The system is good and provides a very straightforward way of executing a complex move," adding that he was also impressed with the full instruction manual that accompanied the system when it was handed over by Kinesys. In addition to this, the two onstage followspot trusses are flown in on Kinesys Elevation motors pre-show so the operators can be picked up on these and taken up to their positions – as opposed to having to climb. A Kinesys Rigger 8 hand-held control is used. The spectacular ‘Take The Crown’ set was conceived by artistic director and lighting designer Willie Williams and stage architect the late Mark Fisher. The show is produced by Lee Lodge and being production managed by Wob Roberts. The show production and Robbie Williams’ performance have already received fantastic reviews as the singer firmly re-establishes himself as a masterful showman and charismatic top level live entertainer. It tours Europe until the end of August.